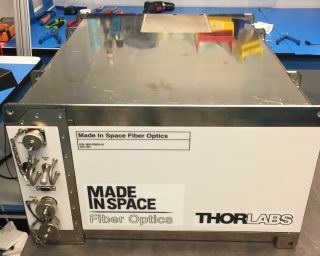 Made In Space has partnered with the New Jersey company Thorlabs on a project to produce ZBLAN optical fiber in orbit. This machine, which is a bit bigger than a microwave, is scheduled to launch toward the International Space Station abroad a SpaceX Dragon capsule on Dec. 12, 2017. A bold plan to rev up off-Earth manufacturing is about to get a big test. A small, privately built machine designed to make optical fiber is launching toward the International Space Station (ISS) aboard SpaceX's Dragon cargo capsule tomorrow (Dec. 12). "We believe that we're really on the verge of something truly amazing here, with kind of using space for industrial purposes for some of the very first times," Made In Space CEO Andrew Rush said during a news conference in late November. The machine that will launch tomorrow, which Rush said is a bit bigger than a microwave, is more specialized. It will produce a type of exotic optical fiber known as ZBLAN, which Made In Space representatives said is difficult to make on Earth: The high-gravity environment here causes tiny crystalline flaws to emerge in the fiber. "In space, ZBLAN optical fiber can be produced without these crystals, providing superior data-transmission capabilities compared to both Earth-produced ZBLAN and traditional silica-fiber optic lines," Made In Space representatives wrote in a description of the project. "This microgravity-produced fiber has numerous applications, including trans-Atlantic telecommunications, high-speed internet [and] lasers, as well as enhancing technologies in space." The Made In Space machine will produce at least 330 feet (100 meters) of ZBLAN on this trial run, pulling the material like taffy from heated feedstock material. The fiber will then come back to Earth (aboard the same Dragon that took the feedstock up) for study and characterization, with the aid of project partner Thorlabs, a New Jersey-based company. If the space-made ZBLAN looks good, Made In Space will aim to sell it, Rush said. And that will be just the beginning. "We do intend to develop this into a commercial product that we sell in large quantities," he said. "The progression of that will be kind of a step-by-step approach." Launching raw materials to space is expensive, but ZBLAN is the sort of high-value product that makes on-orbit manufacturing economically feasible, Rush has said. And the company can make a lot of the material from a relatively small launch mass — about 2.5 miles (4 kilometers) of fiber per 2.2 lbs. (4 kilograms) of ZBLAN "preform," Rush said during the news conference. There's a lot of other cool stuff going up on the Dragon tomorrow as well: for example, a super-sensitive space-junk sensor, an experimental new bone adhesive, and an instrument that will measure the amount of energy going into and out of the Earth system with incredible precision. And the launch itself will be a milestone in SpaceX's quest to develop reusable spaceflight systems, a key priority of the company's founder and CEO, Elon Musk. The Dragon flying tomorrow already has one space mission under its belt, as does the first stage of the Falcon 9 rocket that will carry the capsule aloft.